Mayor Rahm Emanuel and Chicago Park District Superintendent Michael P. Kelly cut the ribbon on the lakefront trail separation project from Roosevelt Street to Wacker Drive. In addition to the completion of the 1.5-mile section, extensive repairs were made to the Queen’s Landing lakefront promenade. 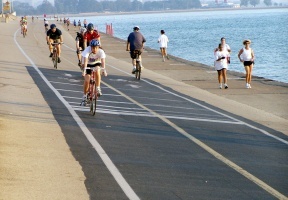 Chicago’s entire 18-mile Lakefront Trail, which runs from Ardmore Avenue on the north to 71st Street on the south, will be separated for cyclists and pedestrians, and is expected to be complete by late 2018. Initial funding was provided by the Chicago Park District. Completion of the project was made possible by a generous donation from Ken Griffin, philanthropist and Founder and Chief Executive Officer of Citadel. 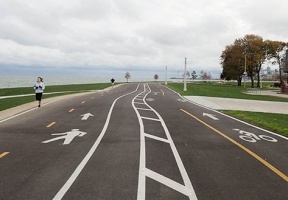 Extensive repairs were also made to revitalize concrete at Queen’s Landing, the lakefront promenade east of Lake Shore Drive that runs from the Chicago Yacht Club to the Shedd Aquarium. Queen’s Landing, which covers approximately 158,000 square feet, connects major tourist destinations including downtown, the museum campus and the Buckingham fountain.